And you thought “Tangled” was Disney’s new animated film, right? HA! 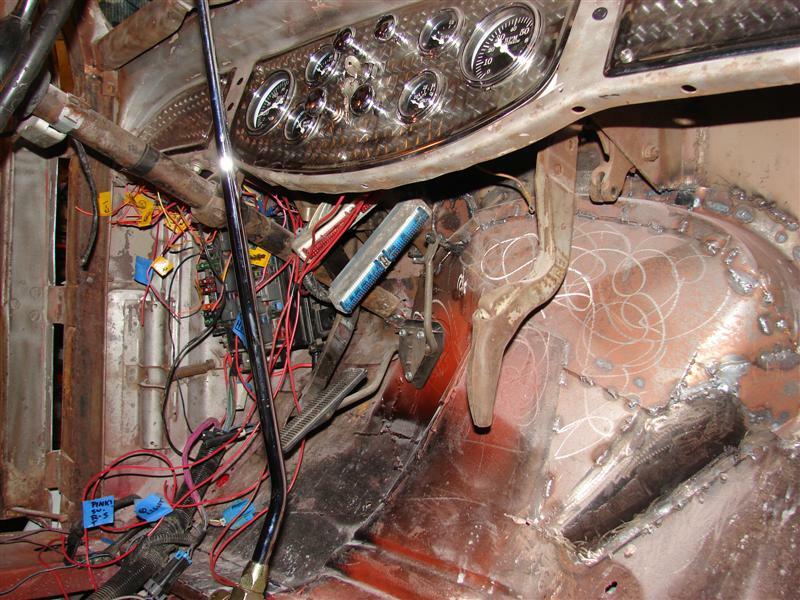 It’s the mess of wires, fuse panels, and electronics jammed under the dash of the Diamond T! Hard to believe, but this represents about 8 hours of circuit tracing, splicing, and trying to fit all this stuff under the dash in a way that looks intentional, not accidental. 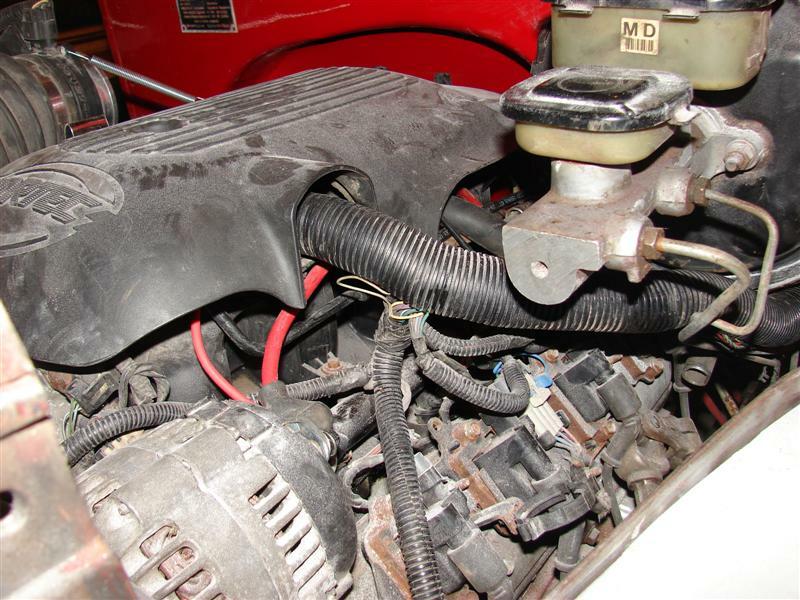 Under the hood, the engine harness actually looks like it belongs. 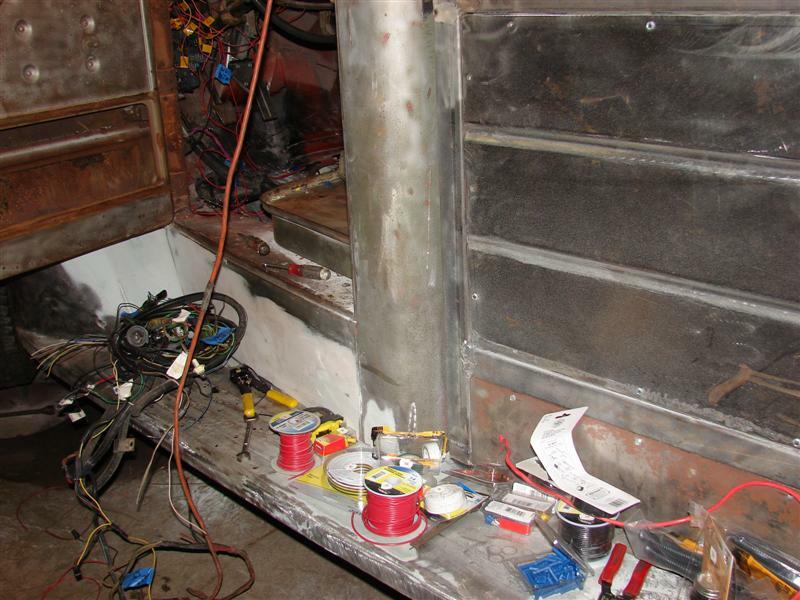 The headlight wiring will be routed beside the inner fender panel, and thence to the fenders, so it’ll be pretty well concealed. This part, looks planned. Sorta. It’s an ugly engine, I admit, but I saw no point in moving the coil packs from the rocker covers. There is really no place to hide them. I may make some aluminum covers, ala’ Corvette, to cover this up. 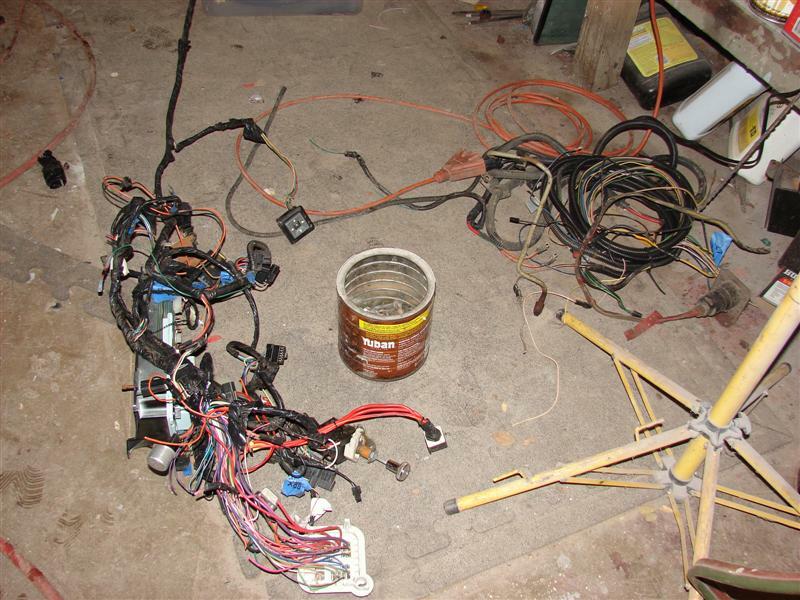 I thought I could sort out enough circuits from the ’01 underhood panel, but it’s SO complex, I couldn’t make head nor tails, even with schematics. 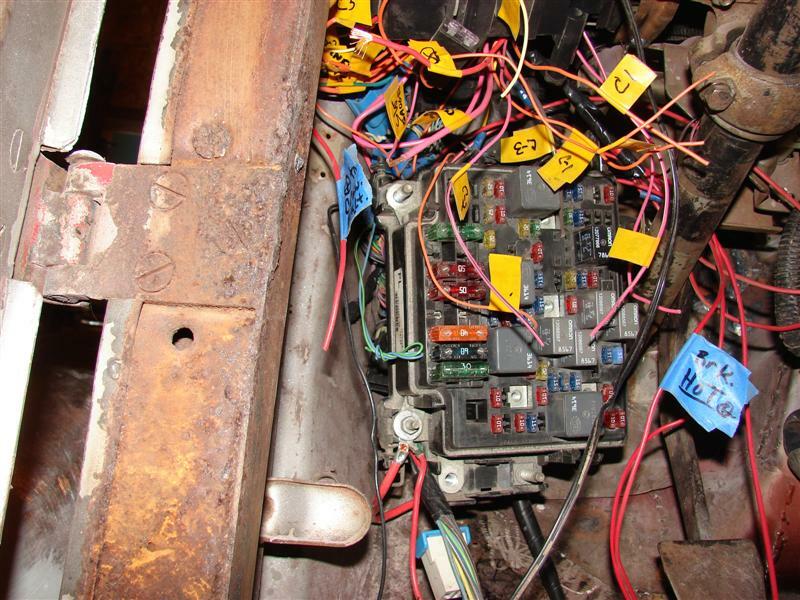 So, it’s function is just the engine harness/ECM, and the body fuse panel for everything else is from the van which donated the front suspension. Turns out it has a nice, simple fuse panel with everything labeled, all I had to do was sort out which wires went to which circuit, which is the reason for all the little yellow tags. It’ll be mounted permanently behind the little stainless dash accent panel on the left, with access from the front. The engine fuse panel, which is mounted just to the side of the kick panel, I’ll make a box with a hinged door, and I’ll make a key to ID the fuses used. It’s much more complex than I wanted, but I wanted the fuel injection and electronic trans, and I didn’t have 800 bucks for a stand alone harness. This was all FREE, which is in my budget. The nice thing about using the salvaged harness from the two donors, is that I have LOTS of various gauge wire, and plenty of plastic loom to string it all in. Once I get it all run, things light tailights and headlight plugs are already there, factory connectors where things are exposed to the elements, and some things will just “plug and play”. It doesn’t look at all original, but that’s not the build style I’m going for, so it’ll all be good. I have to make a mount for the ECM, and then I can send it out to be reflashed to remove the VATS, the EGR, the two downstream O2 sensors, and various other programs it doesn’t need. Sounds like I know what I’m talking about, but really, it might as well be Latin. Now, if I could just find the good battery that came with the donor van, I could, in theory anyway, crank the engine over! Dude this is completely awesome! I think I would have sprung for the harness, but I’m not known for my financial intelligence. This is actually what I would want on any hot rod I might build. The LS engines are all over the place and easy to get with plenty of power. Have you got any pictures and dialog about mounting the engine and trans in the frame, etc? I may well wish I had bought a harness before this is all over, but, I like the idea of salvaging what came with the engine, and I’m still trying to get my money’s worth from that stupid van I bought and ended up not using the engine/trans!